This weekend I am going into hospital for a procedure, so I thought that I would write about the grey nurse shark. Also known as the sand tiger shark, these large sharks grow up to 3.2 metres long. They have so many rows of razor sharp teeth, that even when they close their mouth, the teeth still stick out. When the grey nurse shark is pregnant, the largest unborn pup eats all of the other eggs, getting bigger and stronger until it is born. During the day, these guys will hide in caves, rocks or reefs. They come out at night to hunt a wide range of fish, squid, crabs, lobsters, rays and other sharks. They are able to kill and eat prey up to half their own size. They are the only shark that swallows oxygen from the surface of the ocean to help them float. Grey nurse sharks are found in most oceans around the world and are considered vulnerable to extinction due to over fishing and a slow reproduction rate. 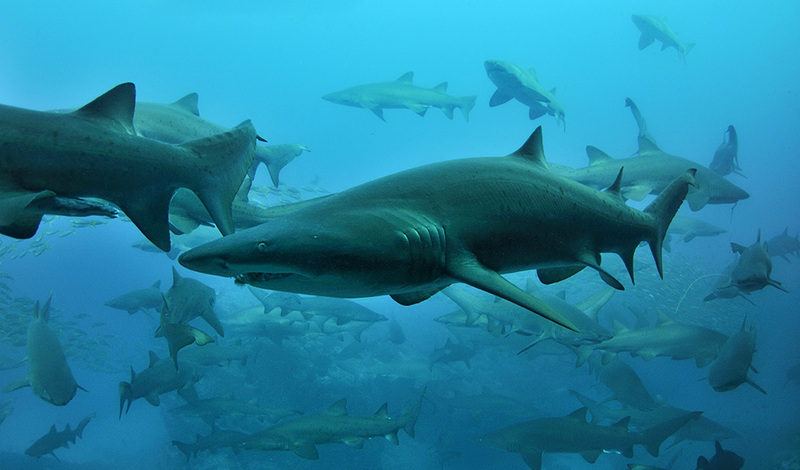 Are there any other interesting facts that you would like to share about grey nurse sharks?